Stretch productivity to its limits with the HP Spectre USB-C travel dock. Equipped with a range of ports and a slim, lightweight design, this essential travel tool Connects your laptop to all your accessories no matter where you are. Brand new and authentic HP products ship from and are sold by Amazon.com (check above). 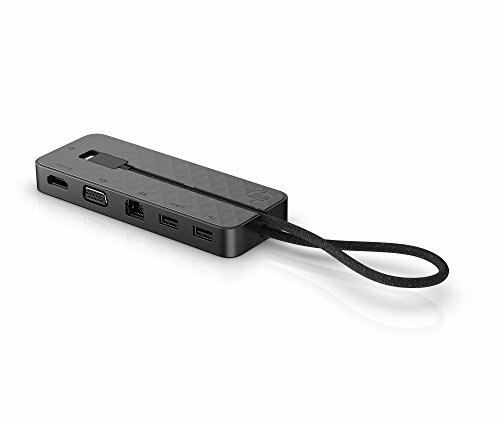 Full connectivity: VGA, HDMI, Ethernet, USB 2.0 and 3.0 ports let you seamlessly connect to multiple accessories or an external display. Lightweight design: At only 0.29 pound (0.13 kilogram), this dock is slightly larger than a cell phone, making it easy to pack alongside your laptop. 15.71-inch 399-millimeter) docking cable: Stay connected to all your accessories without worrying about space thanks to an extra-long cable. Plug and power: Only one USB-C laptop port required for Travel Docking and power functions. Compatibility: Rigorously tested across HP laptops with USB-C charging ports. Dimensions and weight: 5.7 x 2.16 x 0.65 inches (144.8 x 54.8 x 16.5 millimeters); 0.29 pound (0.13 kilogram); cable length 15.71 inches (399 millimeters).